Isn’t it cool to add tasks very fast and on-the-go? We are eager to tell you about some really smart new features for adding tasks with your Android task manager MyLifeOrganized. They all are based on MLO Input Parser functionality used for instant and detailed task creation. Note: The features mentioned below are available in the Pro version of MLO 3 for Android. 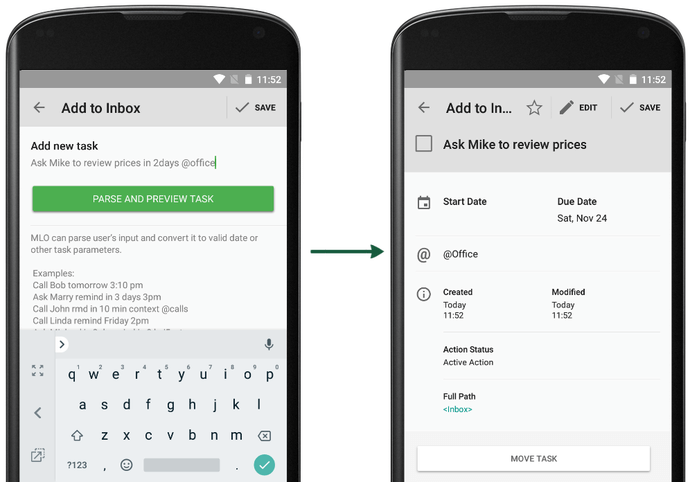 “Add to Inbox” on Android has been taught to parse the text entered and create a task with the ready-made properties, like it does in the Windows version. Note: If you click "Save" immediately the input will not be parsed. You can always check examples and reserved words inside the app. Parsing by voice input with the Widget/Shortcut. This option provides the best experience as it enables task parsing with just one tap. Basically, you only need to have your smartphone unlocked, tap and that’s it - just add as many tasks as necessary. This is one of the most significant feature updates for us. The team has long worked to perfect our MLO app with the best practices and tools like voice support. As usual, you are armed at all points to save your time and voice to-dos coming to your mind! Now you won’t forget a thing. The thing is MLO is recognized as one of the applications that can accept notes from Google. It is ready for voice control through Google Assistant right away - the functionality is enabled by default. The first time you use the command, you will be asked to choose the default app. If you had previously used another note-taking app, you can change it to MLO using our instruction. In case the “Ok Google” command isn't working for you, check the settings. Tip: Network connection may be required for some voice commands to work properly. There is no longer a need to even pick up your phone. Now you can add tasks to MLO even when you are driving a car, just make sure 'OK Google' is enabled to unlock device. Even more so, it reads back what you have just added by voice. Very convenient for those who have their hands occupied or cannot see the text. Tip: You can disable the option anytime in MLO app: go to Settings → General Settings → Settings for adding task → Speak back task added by voice. As you may notice, there is a countdown timer in the top right corner. After 10 seconds of inactivity the task will be created as it is. Tap anywhere on the screen if you wish to interrupt the automatic task creation and modify the task details. You can also tap “Back” to open the text parsing screen. If everything is correct tap the checkmark to save the task. Tip: You can disable the countdown timer: in MLO app go to Settings → General Settings → Settings for adding task → Use countdown timer. Along with the main command for creating a task there are other functional voice commands you can use for managing MLO by voice. - "OK Google, take a note, open the view [name of the view]"
- "OK Google, take a note, open the view [name of the view], profile [name of the profile]"
- "OK Google, take a note, snooze all reminders in/for [snooze period]"
- "... snooze all/reminders/all reminders/the reminders". So, the pause does the whole thing! Creating tasks using the parser, especially voice-to-text, is much quicker. It frees up time for what is really important now, maintaining your work and life balance. Add the new features to your practice today and feel free to share your experience here or on our forum. Moreover, the above-mentioned features are described in more detail in the article on our website which you can refer to further. 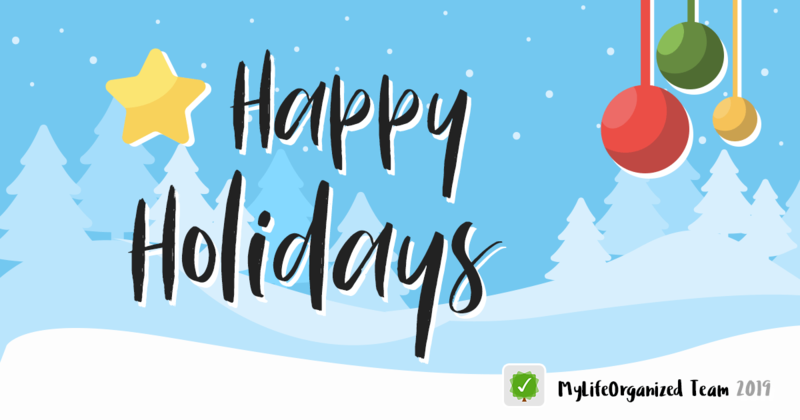 The MyLifeOrganized Team wishes you Happy Holidays! The 2018 year is coming to a close, but not over yet. Now is the time to make one last strong push to achieving more in the next year. We find this to be the perfect time to reflect on the events of the passing year and plan for the year ahead. For the MLO team it was full of accomplishments. A lot of boxes are checked off in our list and still there are many things left to be done. In 2018 we released the long-awaited MyLifeOrganized ver.5 for Windows with a new more intuitive interface, support of 2-way sync with Google Calendar and Markdown and many other cool features. We've been continuing working on improvements for the iOS version. And there is a holiday gift for you - check for the update with text tags support! It should arrive shortly. New MyLifeOrganized 3 for Android! It’s been a really productive year for our Android beta team. After months of heated discussions on the beta forum and extensive testing the MLO team is happy to announce that the new MyLifeOrganized 3 feature pack for Android went live! Check out our video on what’s new in MLO 3 Pro for Android! Install the update and find the optional MLO 3 Pro feature pack inside. 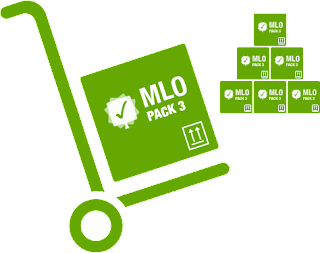 There is a 30-day free trial period for the MLO 3 Pro feature pack. To use the new features after this period you’ll need to proceed with the paid upgrade. And don’t worry, all the Pro features of your MLO 2 stay with you in MLO 3 regardless of whether you decide to get the new MLO 3 Pro package or not. Note: If you are a registered user of MLO 2 Pro, you get a significant discount for upgrade to MLO 3 Pro. We hope the updated MLO applications will help you keep your momentum going and achieve even more next year. Watch the video presentation and download the new version from Google Play or our website. You can learn more about the new version and update procedure on our website. Thank you for your feedback. You make MyLifeOrganized better! MyLifeOrganized 3 public beta: the cutting-edge task manager for Android is coming out! It’s been a really productive year for our Android beta team. After months of heated discussions on the beta forum and extensive testing we are ready to announce a public beta release of a smarter and more powerful MyLifeOrganized feature pack 3 for Android! It is true that being a sophisticated solution with multiple options and features MyLifeOrganized 3 provides us with a lot of opportunities. Some of the options are often more necessary than other, so we need to place them closer than other. Based on the ideas of quick access and user customization we’ve added such handy features as Promoted action button, Toolbar configuration and Task edit configuration. The other thing we aimed at was to make a task adding process fast and enjoyable. This is why several MLO 3 features deal with this. From now on with the MLO Input parsing you can add a new task with the ready-made properties rapidly and in different ways. No more need to enter each property separately, just type in or dictate everything in your natural language and MLO will create a task for you. You can do it with the MLO Widget/shortcut or using Google Assistant! 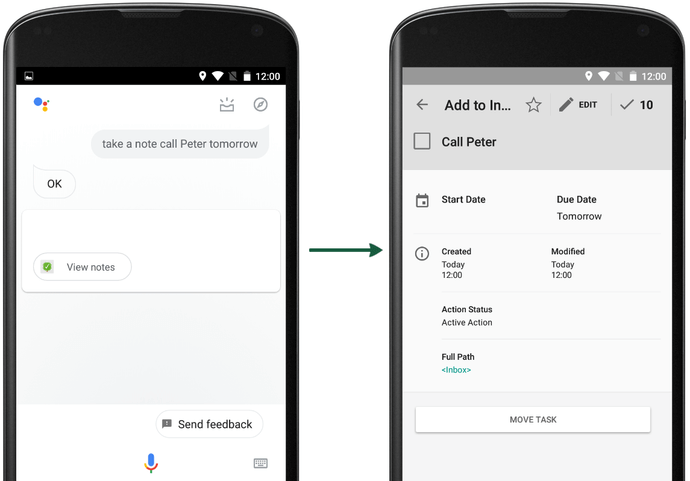 Simply by saying the key words “Ok Google, take a note” followed by task information you can create new and manage existing tasks. Just in seconds, even not touching the device. We’ve been always listening to what you say, and much enhanced another great option for you to use each day - Multiselect. It now works with more advanced actions like edit properties of all selected tasks at once, as well as mark tasks as complete/incomplete and skip occurrences. Advanced MLO users will like the Manual view update feature. Now you can remove a star in the 'Starred' view and the task won't disappear from the view until you tap to update it. Make other changes you need and manually update the view once you are done. And that’s just a part of the full list of improvements. MLO 3 for Android also comes with flags in widget, text tags, fingerprint to secure your profile and many other cool things that help you keep everything under control. The above-mentioned new features will be described in more detail in further articles on our blog. The main (not beta) version will become available very soon. For now, get ready to explore these and much more uncovered things with the public beta version! There is a 30-day free trial period. To use the new features after this period you’ll need to proceed with the paid upgrade. And don’t worry, all the Pro features of your MLO 2 stay with you regardless of whether you decide to get the new package or not. Please find more info on our website. This is just a start - we will continue working on MyLifeOrganized 3 for Android, adding more handy features based on your feedback. You are always welcome to comment here, in social networks and on our blog! Thank you for being with MLO! Users who visited our site in the last 3 days may have noticed a warning about the insecurity of its contents. We would like to let you know that this was a mistake by Google and the issue has been already resolved. Still, we would like to comment on it. On Friday, November 30th, we received an unexpected message from Google stating that mylifeorganized.net site contains harmful programs. To be more precise, it said that the installation files of our flagship MLO-Windows have a virus. We immediately assumed that there was some mistake on Google's side, but still we audited our files. Making sure that there were no malicious files in the MLO software, we contacted Google. A few days later, Google confirmed that there were no problems and removed all the warnings from mylifeorganized.net. Thus, it was a false-positive detection from Google. Unfortunately, all these days our site visitors were misled by the security warnings. We would like to emphasize once again that we are very serious about the security of our software. The installation files and the application itself are signed with a digital certificate, which excludes the invisible virus break-in. The site is hosted on a secure AWS platform that meets the latest security standards in the industry and we're continuously monitoring it. We are currently working with the Google team to prevent such issues in future. We are sorry for any inconveniences. Thank you for your patience!